Cryptocurrencies are an exciting new technology poised to disrupt the way financial transactions occur. Whether money is sent, spent, invested, or more, cryptocurrencies represent a paradigm shift in how we think about money. Cryptocurrencies have been around for over 8 years, and they currently have a market value of around $170 billion. Recent media spotlight paved the way for more and more people to take note and delve a bit deeper into the world of cryptocurrency and its purpose. So, with this starter’s guide we want to give you a good understanding of what cryptocurrency is all about. Cryptocurrencies are distributed digital currencies, much like a form of digital cash. They allow for seamless, direct, and extremely fast transactions between parties. You have full control over your payments and balance, and can spend and earn with ease and transparency. Because you have full control over your cryptocurrency, you don’t need to rely on a central authority to validate your transactions, all validation is done by the cryptocurrency network. Today, credit card companies, banks, and others act as the ‘gatekeepers’ to your money. You trust them to protect your information and your money, and in exchange, they manage transactions to ensure that everything is in order. However, cryptocurrencies don’t require a central authority and instead manages transactions in a distributed fashion. As such, while a bank might have a database that’s an obvious target for hacking for someone to steal your money, cryptocurrencies aren’t susceptible to these attacks. Additionally, cryptocurrencies can process transactions in a matter of seconds or minutes, and not hours or days as it may take to send money today. Cryptocurrencies, often referred to as coins, are stored in digital ‘wallets’ that you use to manage your payments. Your wallet is protected by a private key – think of it like an extremely complex password – that only you know about. You can spend or send money by submitting a transaction from your wallet to someone else’s. Like cash, you can spend the money however you want – whether lending to a friend, paying for lunch, or even paying an employee. Unlike cash though, as cryptocurrencies are digital you can pay with a wallet app on your phone, with a special keychain, and in other ways that make cryptocurrency easier to use. Cryptocurrencies were developed as an application on top a cryptographic invention known as blockchain, hence the name cryptocurrency. Blockchain is a technology that will support multiple technologies – cryptocurrency is just one of them. But importantly cryptocurrencies, as we have them today, would not be possible without the blockchain technology. So, what is blockchain? A block is a complex mathematical problem based on a cryptographic technology (called a “hash”) which computers aim to solve. Once the mathematical problem is solved, the block is ‘complete’. The important property of a block is that if you change any information inside of it – like transaction data – becomes invalid, or broken. The only way to fix it is to replace the incorrect data with the correct, original, data. When a new block is created, it takes data from the previous block, creating a link – hence the term blockchain. In a blockchain, if any data in any block is altered, the entire blockchain from that point onwards is broken. You can think of it like a tower of wooden blocks, if you break one block in the middle of the tower, all the blocks above it topple over. The only way to ‘fix’ the tower is by correcting the data that was tampered with. In fact, blockchains are often measured in terms of ‘height’ which is the total number of blocks in the tower. So, the older the data is, the more secure it becomes. Generally, a block will be considered ‘valid’ once enough additional blocks are added to the chain in order to ensure security. In cryptocurrencies, the blockchain is used to store an immutable transaction ledger for the currency. People called miners solve these mathematical problems. They are responsible for bundling together transactions and then solving the mathematical puzzle. Mining can be very computationally difficult and thus requires powerful computers to solve these puzzles. The computers cost money and importantly require electricity to run. In order to incentivize people to mine, they are given a prize for their work – either in new coins, transaction fees, both, or otherwise. Part of a miner’s job is also to ensure that transactions are valid. They do this by ensuring that the person attempting to send coins has enough to send – they can examine the existing blockchain to determine a wallet’s balance. Because the blockchain is available for anyone to view, every transaction made by every wallet is visible to all. While this may seem like a privacy concern as someone can track your balance and spending, you can actually have as many wallets as you want, and there are technologies and specific cryptocurrencies that exist to provide complete anonymity while still maintaining the integrity of the blockchain. Anyone who wants can have a copy of the blockchain, so when a miner successfully solves a new block, they announce it to the network to get acceptance of the new block, or consensus. Other miners first verify the transactions – this is a security measure to ensure that a rogue miner doesn’t try to facilitate invalid transactions – and then add new blocks to the latest blockchain. As additional blocks are added to the chain, older transactions are considered confirmed. The more confirmations that a block has, the more it is trusted. As the network verifies the transaction ledger, it is called a distributed ledger. This is opposed to a central ledger that a bank might maintain. Unlike a bank’s central ledger though, the distributed ledger can’t be hacked, broken, or counterfeited. As with any time you’re dealing with money, security is one of the ultimate concerns. 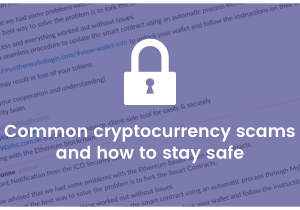 Cryptocurrencies have numerous security measures designed into the technology to ensure that individuals and the entire network are secure. On a personal level, each wallet is secured by a private key to which only the owner has access. Your wallet also has an address that is used to place transactions from wallet to another. In order to place a transaction, you must digitally sign it with your private key to prove that the owner is authorizing the transaction. This means that even if someone else were to find out your wallet’s address, they would not be able to make any transactions. However, if you were to give someone your private key, or if they somehow found it out from you, they would be able to authorize any transactions on your behalf. This is why it is of the utmost importance to keep your private key private! As mentioned already, the underlying technology of blockchain makes it impossible to edit transactions after they have occurred. Additionally, because of the way transactions are reviewed, cryptocurrencies also aren’t susceptible to the “double spending” problem where a person tries to pay two different parties with the same money. The increased safety of the network over conventional methods makes cryptocurrencies safer, and thus also cheaper. If you look at the transaction cost of most conventional ways to pay (for example 3% fees for merchants on credit cards), the fees are meant to cover problems like fraud, chargebacks, and more that is spread across all users. If you take away these costs, you can provide ultra-low-cost transactions, sometimes just pennies in fees for thousands of dollar transactions. Did You Know? The FBI supposedly owns 15 percent of the world’s Bitcoins after raiding a black market. Bitcoin (BTC) is the original cryptocurrency, it is the market leader due to its established reputation worldwide, its security and the huge community base powering it. It holds significant value and has received media attention around the world. Retailers such as Overstock.com accept payments and Bitcoin, and Amazon allows consumers to purchase gift cards with the cryptocurrency. Currently, Bitcoin is the most valuable cryptocurrency and is valued at $96 billion, or about 57% of the market. Ripple (XRP) is a digital asset targeted to allow financial institutions to make global payments more easily and more cheaply. To meet the demand of these institutions, their technology also focuses on transaction throughput and already can handle about 200 times more transactions per second than Bitcoin can. They already boast a strong list of customers which includes RBC, UBS, Santander, CIBC, and more than a dozen other banks, exchanges, and payment providers. Ripple is currently valued at $7.8 billion. Litecoin (LTC) was released in 2012 as a ‘lite’ version of Bitcoin, built using much of the original Bitcoin code base. Its primary advantages are that it supports much faster payments and far more transaction throughput than Bitcoin, capable of handling global payments in less than one second. Litecoin is sometimes referred to as the ‘test bed’ for Bitcoin because it is known to adopt and implement technological advancements much quicker and more smoothly than Bitcoin. It is currently worth $2.9 billion. Did You Know? A journalist was once given a Bitcoin live on TV back in 2013. It was quickly stolen from him by a viewer. Lesson learned: do never expose your private key. Now that you have a bit of a better understanding of what’s cryptocurrency all about, you may want to learn more about some of the specific currencies or get started by buying some. If you want to go into depth on the technical specifics, we recommend reading more about the various cryptocurrencies on Cryptominded’s Coin Wiki. Additionally, read some of the whitepapers, for example those of Bitcoin and Ethereum. We also love to share with you the ‘Learn More‘ collection. Do you get excited about cryptocurrency and do you want to buy some? Coinbase is a good starters exchange to acquire some Bitcoin or Ethereum, however if Coinbase is not available in your country, check Cryptominded’s WheretoBuy tool. At the moment, we’re working very hard to write more guides. For example on storing, buying, mining & trading, besides continuously improving this starters guide. Want to get an update when we release a new guide? Then subscribe to our newsletter (which by the way has a lot of other cool content as well, such as exclusive community interviews). We hope you got a little bit more excited about cryptocurrencies and have gotten a better understanding from this Starter’s Guide! If you’ve any feedback for the guide, let us know! Satoshi Nakamoto is fictional name provided as the inventor of the first ever cryptocurrency, Bitcoin. Some believe that Satoshi Nakamoto is, in fact, a pseudonym for a group of people. The community believes that Nakamoto started working on the project in 2007. Nakamoto then quickly moved to publish a piece that explained in full what Bitcoin was, how it worked and how double spending would be prevented. The first mining took place in January 2009 after the project was registered on SourceForge.net – a website focused on open source software. A few days later the first ever transaction using cryptocurrency took place. The public bitcoin transaction log shows that Nakamoto’s known addresses contain roughly one million bitcoins, or over $2 billion. To this day the identity or identities of Satoshi Nakamoto is or are not known, but there is no doubt that Satoshi Nakamoto has already left an incredible legacy on the financial industry. Bitcoin founder Satoshi Nakamoto made the first cryptocurrency transaction, sending Hal Finney 100 bitcoins on January 12th, 2009. This is a great passage. I am still learning about crypto currencies. I found this a help. What a lovely guide. I’m going to use it as a reference for newbies. It could use some updates tho. Thank you for your free education blogger and thank you for your generosity giving, in return, wishing you a Merry Christmas and a blessing year ahead, May 2018 fill you with magic, health and success. Admiring the time and effort you put into your blog and in depth information you offer. It’s great to come across a blog every once in a while that isn’t the same unwanted rehashed information. Fantastic read! I’ve saved your site and I’m including your RSS feeds to my Google account. Thank you for educating us on Cryptocurrency. I have a better idea about it now.